Would you drive across a paper bridge? 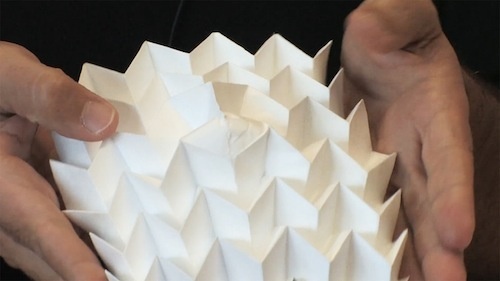 Engineers in Japan and the United States are intrigued by origami. That’s the Japanese art of paper folding. Picture those paper cranes we made as children. Why would origami interest engineers? Think about how folding paper changes its properties. For example, a sheet of paper is floppy and tears easily. But fold and re-fold that same sheet and it can support many times its weight. An engineering marvel! The engineers experimented with what’s called Miura-ori folding. That involves folding paper into a compact shape that can spring back open in one motion. It gives otherwise fragile paper not only strength, but springy, mechanical qualities. So using Miura-ori folding, the engineers created paper tubes. They folded them into collapsible zig-zags. Then they nestled two tubes together, zipper style. Result? Flexible tubes exponentially stronger than the paper they’re made from. The engineers envision metal bridges based on the concept. Or emergency shelters that can fold flat for easy storage. As for that paper bridge? Still best for matchbox cars. Ah well.